Corticotropin Releasing Hormone or CRH is a highly conserved peptide hormone comprising 41 amino acid residues, which stimulates both the synthesis and the secretion of adrenocorticotropic hormone (ACTH) in the corticotropin-producing cells (corticotrophs) of the anterior pituitary gland. It is a releasing hormone that belongs to corticotropin-releasing factor family. In humans, it is encoded by the CRH gene. CRH is chemically classed as a neuropeptide hormone — a protein-like molecule made up of a short chain of amino acids produced in the brain that functions as a hormone. CRH is also synthesized in peripheral tissues, such as T lymphocytes, and is highly expressed in the placenta. In the placenta, CRH is a marker that determines the length of gestation and the timing of parturition and delivery. A rapid increase in circulating levels of CRH occurs at the onset of parturition, suggesting that, in addition to its metabolic functions, CRH may act as a trigger for parturition. Corticotropin Releasing Hormone or CRH is the major hypothalamic activator of the hypothalamic–pituitary–adrenal (HPA) axis. Major functions of the HPA include: (i) influencing fetal development of major organ systems including lung, liver, and gut, (ii) metabolic functions, including the maintenance of normal blood glucose levels during the fasting state via glycogenolysis and gluconeogenesis, (iii) modulation of immune function, and (iv) maintenance of cardiovascular tone. 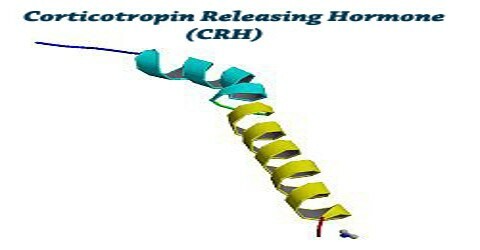 Corticotropin Releasing Hormone or CRH gene is composed of two exons and an 800 bp intron, and is highly conserved among vertebrate species. The entire protein-coding region is contained in the second exon. 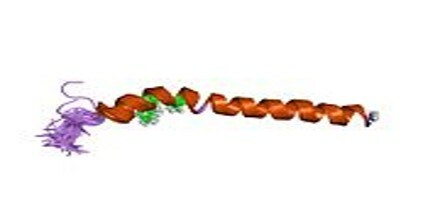 Human CRH is processed from a preproCRH molecule, 196 amino acids in length, which contains a hydrophobic signal sequence, required for secretion, at its amino-terminal end. The middle of the molecule contains 124 amino acids of unknown function. The promoter region of the CRH gene contains several putative cis-regulatory elements including, a cAMP-response element (CRE), AP-1 sequences, and glucocorticoid-response elements. The intron contains a restrictive element-1/neuron restrictive silencing element (RE-1/NRSE) sequence, which binds restrictive element silencing transcription factor/neuron restrictive silencing factor (REST/NRSF), and functions to restrict CRH expression to neuronal cells. CRH is produced by parvocellular neuroendocrine cells within the paraventricular nucleus of the hypothalamus and is released at the median eminence from neurosecretory terminals of these neurons into the primary capillary plexus of the hypothalamo-hypophyseal portal system. The portal system carries the CRH to the anterior lobe of the pituitary, where it stimulates corticotropes to secrete adrenocorticotropic hormone (ACTH) and other biologically-active substances (β-endorphin). CRH can suppress appetite, increase subjective feelings of anxiety, and perform other functions like boosting attention. Although the distal action of CRH is immunosuppression via the action of cortisol, CRH itself can actually heighten inflammation, a process being investigated in multiple sclerosis research. 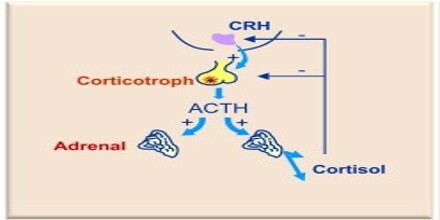 CRH or Corticotropin Releasing Hormone binds to sites in the anterior lobe of the human pituitary that correlate with the distribution of corticotrophs. 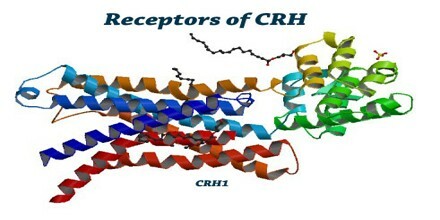 CRH receptors in the anterior pituitary gland are low capacity, high affinity receptors, with a Kd for CRH binding of about 1 nM. To date, two CRH receptor genes have been identified in humans and other mammals, with a third gene described in the catfish. 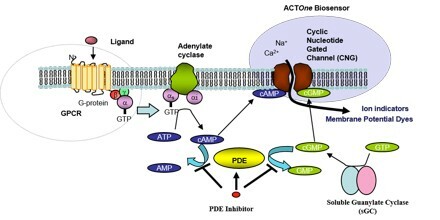 Both receptors consist of seven transmembrane regions coupled to adenylate cyclase via Gs. Both receptors have at least one additional isoform resulting from an alternate splicing event. A number of neurotransmitters have been implicated in both the positive and negative regulation of CRH release. Acetylcholine, norepinephrine, histamine, and serotonin increase hypothalamic CRH release, while gamma-aminobutyric acid inhibits it. In addition, cytokines such as interleukin-1β, tumor necrosis factor, eicosanoids, and platelet-activating factor have all been shown to activate the HPA axis by increasing hypothalamic CRH expression. With adrenalectomy, two groups noted that CRH-containing cells of the PVH, which project to the anterior pituitary via the median eminence, acquired expression of arginine vasopressin (AVP).